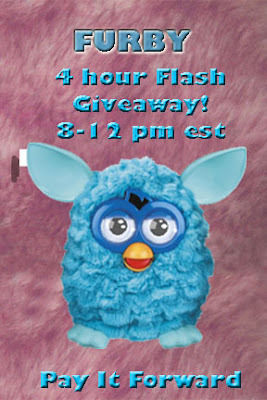 One Mom's Moxie: Win a Furby - 4 Hour Flash Giveaway!! Right After Halloween next year, I'll start Christmas shopping. I usually start about 4 months before. I plan on starting in August of next year. I start right after Christmas with the end of the year sales. I don't start until Black Friday every year. Already got a couple thing day after Christmas sales. Now! I put it off more than usual this year and the stress wasn't fun! I never stop :), When I see a great deal, I grab it up! I plan on starting in October but I usually don't finish till last minute. I usually start in july! I would love to start as soon as I can afford it. i shop year round for awesome deals! Already started with 5 grandson's and grandaughter do any day!! I usually start in August.. I'm already planning ahead. A Furby would make a great gift for my granddaughter. I try to look for good deals year round, but I usually buy with specific people in mind and typically on trend, so if I found something in spring for someone, I would never be able to wait until Christmas to give it to them! I've already started! And will continue to shop throughout the year! I've got to stop procrastinating! I started right after Christmas day, with gift wrap, gift bags, bows and gift labels! Im starting in aug. As i have four children im rasing with full custody 3 grandchildren and a neice. Not until November or December and I get this year paid off. I start at the beginning of the year and pick things up all year long! I will probably start this summer. I can't even bear to think of another Christmas right now! ASAP. iLife getting great deals and having awesome gifts to give at Christmas time! When I come across something that I think would make a perfect gift, I buy it. Then I have to remember where I hid it! I never stop Christmas shopping lol. Whenever I find a good deal, I buy it, then I have gifts for Easter, birthdays, Christmas, etc. It's less stressful and much cheaper. I start in or around September but I do most of it in December! I usually start thinking and looking during the summer but don't actually buy anything till September. I am hoping to find deals all year long this year. Due to unexpected set backs financially we were not able to have even one gift this year. I don;t want to feel like this again. Even bath sets and things like that would have been better than nothing to open at all. I am hoping to buy small gifts through the year as I find deals, due to unexpected financial set backs we did not get to have even one gift this year. I don;t want to feel like this again. Usually about March or April.